Wandering Aramean writes about a credit card! And the world hasn’t stopped spinning. But seriously, it doesn’t happen all that often, and definitely worth a quick read if you have an AMEX Premier Rewards Gold card! From FrequentMiler – Another potential prepaid card similar to Amex’s awesome lineup of cards (Bluebird, RedBird and Serve); and the survey says? If you have a Discover checking account, you too could earn some points really quickly! The Doctor (of Credit) shows us how. And to think that I had no idea Discover had checking accounts! From Head For Points: British Airways pays quite a bit of money so that its top tier passengers don’t have to go up and down escalators, through hill and dale (and maybe a TARDIS), to get to Galleries First, or the Concorde Room. Trevor’s been to Galleries First, and the Concorde Room, but apparently this door is so secret, that even he didn’t know about it. He’s vowed that he will change that next time through, just as soon as he gets over his last experience through Heathrow – which is a whole other story. And speaking of lounge access, Gary Leff notes that British Airways wants to offer fares without lounge access or priority boarding. The question is: if airlines are treating customers at the transactional rate, what is the point of loyalty? Need an alternative to the ANA search tool? Joe does after his Star Alliance meltdown. Canadian Kilometers has an idea that we just might like. Apparently, there was a Frequent Traveler University (FTU) in Dallas this past weekend – and we’re forced to catch up from sessions posted by bloggers. Jeanne – formerly of Heels First Travel, now Le Chic Geek (Trevor is in love with the name) – provided a great presentation on showing the value of your status to your company. In short: maximizing business travel, which is something Joe definitely did. We’d be remiss if we didn’t also mention that Le Chic Geek officially launched (although we’re a week late) – but alas, we missed the drink. Jeanne, the first round is on Trevor, next time! Joe will probably buy you a drink, too…mostly because I, too, am a card-carrying geek. From Dia the Deal Mommy – The lineup for speakers for 3rd Family Travel for Real Life have been announced! Trevor is proud to be partnered up with fellow Saverocity blogger Kenny from Miles4More. If you want to go and haven’t gotten a ticket, you might want to jump on that. For folks in the DC / VA / MD area (aka driving distance to Dulles), Discover Dulles is holding an event to celebrate the arrival of the inaugural Aer Lingus flight from Dublin. Trevor attended one of these, and can personaly attest that its a great time. Finally: if you got an Apple Watch today, your fist app should be TripIt. Though I’m not sure why you would have an Apple Watch to begin with. You’re smarter (and better looking) than that. FrequentMiler encountered one of the bigger concerns we have in the mile and point game: losing points! He’s trying to make lemonade out of lemons and sharing his mistake so others can avoid it. He’s even created a checklist. From The Doctor Of Credit – Offers Bot, one of the better options for automatically jumping on AMEX Sync. has been suspended permanently (cue the Dramatic Chipmunk). He does mention alternatives, including Wandering Aramean’s SyncAssist. Like golf? Have a Citi Prestige? You’re in luck! The Doctor shows us how you can get 3 free rounds of golf per calendar year. If you don’t have a Citi Prestige – you’re best off going into a branch and applying (we think?). Chasing the Points highlights that shopping direct may not always be the best option. He highlights eBay, but we see stores also sell on Amazon, and to a lesser extent on Sears. We’re sure there are other places out there. In that similar vein – Chasing the Points has some important notes about credit cards: where to apply to them, how not everyone is treated the same with Bank Americard deals, and more. Chasing the Points highlights some awesome stuff – no, seriously. Check out his post, and check out CashBackMonitor if you haven’t yet. When I’m not riding the Greyhound bus, I may have finally found a place for my Star Alliance miles to go – Copa! Gary Leff of View From The Wing shares some info as to why Copa may be the best thing to happen to Star Alliance since Aegean. Is it possible that we have a new oneworld hub? Maybe – and it could be Vienna. Finally: this is the aircraft you’re looking for. ANA unveils a Star Wars livery – which is just so cool! Perfect timing for the second trailer to come out…giving a whole new meaning to the term #avgeek. Milenerd has a Public Service Announcement: Frontier miles expire 6 months after last date of activity. But don’t ask Frontier to tell you when that is! Lufthansa appears to be the latest airline to have their frequent flier’s accounts hacked. As Joe correctly predicted, this is becoming a bigger and bigger issue, and we hope that airlines are taking note and enhancing their security. Did you recently get approved for the Citi Prestige Card? Our friend, The Doctor of Credit, says it’s possible to get upgraded for the 50,000 signup bonus. All you have to do is ask. According to Brian Sumers, United is ramping up efforts to monitor operations and social media in order to prevent mistake fares from getting out. Sumers says they may still happen, but you better be quick, or keep it off of social media. Logically, its probably best to keep it off social media anyway. Not that you will…but it’s advisable. And apparently, airport runway breaches are a thing in the United States. More than anyone truly realizes. From Airways News – Boeing and Airbus are pushing planes out fast, however the 4 big seatmakers are what is slowing things. As if we didn’t already know this was a problem. Economy and Beyond reports that Finnair has announced A350 services — usually airlines operate shorthaul first, then take some time with the long haul, it looks like Finnair will be doing just that. The first three long haul services do start in the last quarter of the year to Asia, Shanghai, Beijing, and Bangkok. Business class looks similar to Qatar Airway’s A350’s, with a reverse herringbone seat, could be nice. From Wandering Aramean: a short review of Doha’s awesome amenities. Its not just the big yellow teddy bear that will draw you in, Hamad International Airport also has a hotel, gym (with pool) and spa! Trevor’s been through Doha quite a bit (even being remembered by some of the gate agents), but not yet made it to the hotel or the gym; unless you could doing the steps between levels of Qatar’s Al Mourjan lounge! Buzzfeed, that paramount of digital journalism, showcases Australian people trying Outback Steakhouse. The best part is at the end, which, if we might say, just puts an exclamation point on the importance of travel. Spinning the Wheel of Credit! FrequentMiler highlights greater benefits with AAdvantage status and the Citi Prestige. A better, cooler RedBird? No, it’s not the Rocking Robin – FrequentMiler has some initial information. Airways News interviews David Neeleman, founder of Azul, formerly involved with all the other cool airlines out there (in some form or fashion), Southwest, WestJet, JetBlue. What if an airplane window could sense that you were looking out of it, and told you what you were looking at? It’s like that Apple iPhone Sky app but for plane windows! Coming soon to an Airbus aircraft near you? How about some light reading? Here’s an interesting grouping of how Airport Codes got their names. By the way, the TSA SPOT worksheet got leaked online earlier this week, but you’ll need to bring your own crayons to fill it out. Biggest lessons we learned? Don’t ask too many questions and don’t whistle while going through the security checkpoint. Meanwhile, Club Carlson is devaluing, too – but not in the good way. Miles to Memories explains why. It never ceases to be fun to read articles about airport abbreviations. Slate educates us of the sources of many airport abbreviations – some we didn’t even know existed! We learned of this from Marty St. George: Subway style maps of cool things, like national parks, A380 hubs, and more! Meanwhile, at Boeing…Reuters reports unfinished Dreamliners are hanging out in the Mojave Desert while they wait for seats to show up. At the cost of up to $200,000 per seat. Let that sink in for a moment. Chasing the Points also shares with us yet another mileage earning debit card! Sort of. Okay, not really. From our fellow Saverocity Observation Deck podcaster As the (other) Joe Flies – British Airways is having an IT SNAFU, and Avios points are missing from many folks’ accounts. If you want to get away from it all, but not go someplace like the JW Marriott Khao Lak, Little Corn Island, off the coast of Nicaragua might be for you. Adventurous Kate shares why this is one of her “Go now” places. Stefan from Rapid Travel Chai attended a rather impressive 70th anniversary of Iwo Jima. This link is to the charter flight, but check out all of the other links in the post, very sobering. Where in the world are the bloggers? From One Mile at a Time: Egypt to stop issuing visas on arrival in May. This is a huge blow for many folks’ premium mileage running strategy. Trevor talked about his strategy here, and did his most ambitious mileage run here. Despite the tragedy in Tunisia, Wanderlusty isn’t planning on cancelling his trip. We wish him the best on his next adventure. Winning: Wandering Aramean won the lottery — a lottery that we suspect will get increasingly difficult to “win” going forward as these deals get far more difficult to achieve. Winning: Points Summary took the Etihad Airways First Chauffeur Service to his flight at LAX. Not a bad way to beat the traffic in Los Angeles – if we say so ourselves. Losing: Dia the Deal Mommy breaks the bad news that the world’s greatest Toys-R-Us in Times Square will soon be no more. It is a sad day, indeed. In case you missed it: The Doctor of Credit points out that you can now send debit card payments to friends via Facebook. A game changer? Possibly. The Doctor knows his stuff when it comes to this spending stuff. Chris Chamberlin fron Australian Business Traveller shares insight into the Emirates Aviation College for cabin crew. From Scott Mayerowitz at Business Insider: the interesting story of airplane models. Finally: Very Good Points educates us on the Starwood Flights and Nights program – something I did not realize existed. Brilliant! Gary of View from the Wing flew an Inaugural(!) Austin to Miami on American Airlines. Perhaps the most notable comment from his post: “…in this case we got the food without the tax.” We’d sure like to fly an inaugural – preferably an international one and in front. …Now that you mention it, Joe did get to fly a Dreamliner during it’s launch year. Not an inaugural flight…but a fun ride, none the less. Stefan of Rapid Travel Chai recently flew Iberia Business Class. Its a good quick read, and something we don’t often see from Stefan. Well done! From Dulles Airport – here’s what those big trains of snow removal equipment are and do. Via gizmodo: the interesting language of Airport Runways. Routehappy – an interesting company that continues to expand – provides a third metric to help consumers choose which flight they take. Gone are the days of price and schedule being the only considerations, or so Routehappy would argue. Those days were gone long ago for us at TaggingMiles. Can big data predict which flight will get you to your destination fastest? The analysts at FiveThirtyEight seem to think so. FrugalHack provides an overview of the many flavors of the companion pass. Its interesting, as we didn’t know some of them existed. Of course, that Lufthansa companion pass can keep on going, we won’t lose sleep! Lucky shares with us the “secret” and unused Admirals Club section in terminal A of Dallas Fort Worth. Have you ever been? If so, was anyone else there? Gary from View from the Wing shares his experience in a federal criminal trial, specifically with small business rewards programs. The biggest key is documenting what the practice is, as to who can use them and for what. Trevor’s written about the three major small business programs – Business ExtrAA (American), PerksPlus (United), and SkyBonus (Delta). Kenny at Miles4More had a great post on what he spoke about at FT4RL – Its pretty impressive that from all the puts and takes, he netted 4 figures profit from the travel he took. Carolina Travel Girl also gave a good review of what we missed at FT4RL. Now we’re kind of regretting not going. Meanwhile, As The (other) Joe Flies recorded a mega-podcast at FT4RL featuring a number of your favorite travel bloggers. He also got an exclusive sit-down interview with several other Saverocity family members, including Nick from PFDigest and Kenny from Miles4More. After completing her second FT4RL, Dia the Deal Mommy is already planning the third! Will we see you there? Stefan of Rapid Travel Chai shares his presentation from the latest FTU Advanced. Even without the talking points, this presentation is definitely full of great tips and tricks! Plus, the New York Travel Festival is only a month away. Should be a great time, if you’re in/near/around/have the points to get to New York. Mommy Points combats a rather difficult situation that has affected us all at least once. Both of us at TaggingMiles have been where Summer and her husband are – and Joe still is. We wish them great strength in this tough time, but know they will persevere and flying once again. Anyone with even a passing interest in international aviation has heard of the Open Skies debate between the American legacy carriers and the luxury carriers of the Arabian Gulf. Trevor and I even debated and discussed the situation on the Saverocity Observation Deck Podcast. While there are no clear answers, there are ultimate winners and losers. As the debate rages on, one major constituent group that could lose are the flying consumers. Because the American legacy carriers are accusing the Arabian carriers of receiving illegal subsidies that have hurt the growth opportunities of the legacy carriers, there could be real and long-lasting repercussions to the accusation. Whether or not the arguments are substantiated in either direction, the damage of the claims alone could create bigger problems for in the long run. Could the Open Skies debate ultimately hurt travelers? Absolutely. Here are three ways travelers could be affected. If the Open Skies debate shakes up the American air space, the first place it could hurt is within the major airline alliances and their codesharing agreements. Qatar Airways, one of the three Arabian airlines in question, joined oneworld in 2013. In addition, Etihad Airways has a significant stake in oneworld member Airberlin and SkyTeam member Alitalia, in addition to starting their own alliance late last year. If the Open Skies debate turns any more sideways, these could be the first thing to come into question. Should the Open Skies debate come to a head and action by either side is taken, the first thing that could disappear are codesharing and alliance agreements between the airlines. As a result, fliers access to the Arabian carriers could be limited to strictly booking directly with them. Or, even more, the Arabian carriers could follow Etihad and opt to create their own alliances, locking out American airlines. In this scenario, the codeshare and alliance agreements would be the first domino to fall. One of the biggest losses that would be felt by the consumer comes from lost award booking availability on the Arabian carriers. Today, many travelers enjoy the benefits of flying some of the best premium class products on points and miles – thanks, in part, to alliance agreements. Under this situation, the Arabian carriers could pull their support for reciprocal award agreements with their airline partners, effectively killing award opportunities with points from the American carriers. While this wouldn’t necessarily hurt the Arabian carriers, the award flier based in the United States could be directly affected. Finally, each of the Arabian carriers have been growing across the United States in leaps and bounds, increasing their destinations every year. 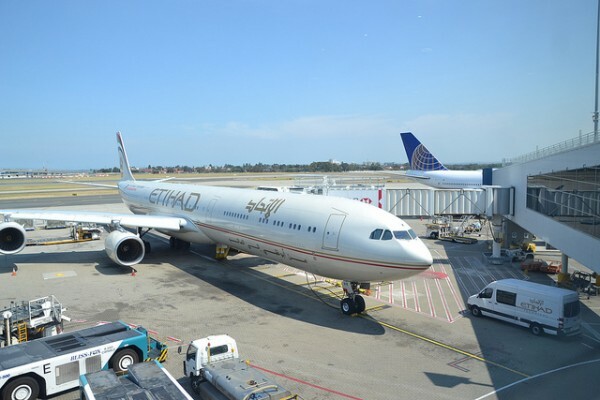 Earlier this month, Etihad announced the first American destination for their super-luxurious Residence first class product would be John F. Kennedy International Airport in New York. That could all end, however, depending on where the Open Skies debate goes. If the Open Skies debate ends in favor of the American carriers, it could mean that growth among the Arabian carriers in the United States would come to a halt, reducing the international outlets to the major international airports. While this is something that the American legacy carriers have been charging forward on, the lack of competition could drive prices up for everybody. If nothing else, deregulation has taught us that the lack of competition is not necessarily a good thing. While we don’t know where the Open Skies debate will go, the first rule of physics reminds us that for every action, there is an equal and opposite reaction. The reaction could ultimately do more harm than good – but what that means has yet to be seen. The (Credit) Game is Afoot! Miles Remaining is starting a new monthly series sharing the credit cards he has, the ones he’s getting rid of, and more. We’ll be interested to see how this goes, as there will no doubt be interesting points going forward. Doctor of Credit and View From The Wing report on a new prepaid card that can be loaded with a credit card (yay!). In fact, Gary reported 2 – while The Doctor reports even more than that. How long it’ll last is anyone’s guess. Its already on FlyerTalk. For you US Airways Credit Card holdouts (guilty): Chasing the Points has an introduction to the new American Airlines cards. Expect this to end up in your mailbox or wallet somewhere down the line. I know I’ll have one…eventually. Speaking of introductions, Carolina Travel Girl introduces us to the AirAsia Asean Pass. The question remains though: do you really want one? Trevor forgot that he wrote a Southwest Companion Pass post many moons ago. None the less, the American Travel Project wrote one better than the two of us could have completed together – so go check it out! We’ll wait for you here. Did you know it’s possible to get upgraded on a Alaska Airlines award ticket as a Delta Medallion? Points Summary found a way to do it – and frankly, I’m impressed! I guess Alaska & Delta can get along, after all. Scott of TravelCodex shares an interesting post about how 13 frequent flyer programs view the world as far as regions. Its interesting how each program breaks regions up in some cases, or combines in others. Drew from Travel Is Free shares a pretty cool graphic on telling the difference between some of the more common planes around the world. Most everyone should be able to identify an A380 or B747, but can you pick out an A330 from a 767? If you can’t…you may need a reminder in the style of Monty Python. The information is coming out about DOT’s decision on United’s Latest Fare. Meanwhile, Wandering Aramean has the most in-depth post we’ve seen so far, although Trevor’s also made the point of what kind of message this sends to non-US consumers. Seat 31B shares how you can get full credit for miles flown on Delta Airlines. If you still fly Delta, you might just be OK.
Oh yeah: Giddy For Points also points out Delta now promises to have your bag to you in 20 minutes or less. Because that worked so well for the delivery pizza industry. Meanwhile, Delta CEO Richard Anderson is still (sort-of) apologizing for saying rude things. All while the Arab carriers are breaking down his arguments. Part of the miles game is trying new things. Frugal Hack reports his findings from testing out the Oink card. We’ll leave the “lipstick on a pig” jokes out. Carolina Travel Girl points out an interesting life hack. Military members on deployment can actually freeze their Starbucks account to keep their gold status. And who says coffee can’t be customer friendly? Analytics are interesting regardless of your industry. Wandering Aramean shares the insight from the Loyalty 2015 conference in Istanbul, Turkey, from a presentation by MasterCard Advisors. I doesn’t surprise us that these things are so linked (such as spending for business class tickets and buying luxury clothing), but its always cool to learn more about the background workings. File this under – developing industry news (no, not the Middle East carriers), Nigeria once again wants to get themselves a national airline. Here’s hoping its successful this time. So far the short list looks to be South African Airways, Ethiopian, and Lufthansa. Its interesting Etihad isn’t in the mix given their past investments. Lucky shares the 8 best airport lounges for complimentary spa treatments. Trevor’s only experienced 5 of the 8 (missing out on Qantas’ Sydney Lounge, Virgin Atlantic’s club in JFK, and Air France) — of course his experience was a bit different with Emirates — having a legitimate shirt off massage rather than a chair massage. Meanwhile, Joe is far too masculine to partake in any of that sort of…pageantry. Airways News provides an analysis on how much of a game changer the Boeing 787 is. Just take a look at the list at the bottom to see how many new routes, the 787 has been part of. Finally: as Cowboy Troy reminds us to never play chicken with the train, we at TaggingMiles remind you to never play chicken with the airplane. Bad things happen. If you haven’t made your plans to attend FTRL2 yet…it’s not too late! There’s rumors flying around that Trevor and As The (other) Joe Flies will make an appearance – and (the other) Joe might even ride the Fung Wah bus to get there! Also, if you haven’t subscribed to the Saverocity Observation Deck Podcast…it’s not too late!